Lighting really dictates the mood of a room. What sort of mood do your lights set? I’m all for lighting that creates an overall atmosphere as opposed to task-oriented lighting. The majority of my chandeliers have multiple bulbs. We give you, say, eight separate lights that are shining up and down, left and right. You end up with a general glow to the room without a lot of heavy shadows. Is that the key to creating great atmosphere? Multiple lights? Yes. I would push people to have lots of small bulbs around a room, as opposed to a single 100-watt bulb in the ceiling. At my home, I have to turn on six different lamps to get the room to look the way I like it. Say we just moved into a new apartment. What should we do first? Look at each room as a whole, especially the architecture. Then use your lights to highlight certain elements. Look at the curved edges of the shade and how that relates to the line it leaves on the wall. The slope of the light should work with the lines of your room. They let the placement of the sockets dictate where the lights go. But what if we have an outlet on one wall and want a lamp on another? I normally make my own extension cords. If you have it in you to DIY, you can get a white or black SVT wire, connect a three-prong male and female plug to either end, and make your own. It actually looks fairly nice, just on the ground. Or invest in great-looking, cloth-covered cords from Best Made or So & So Designs. They’re totally crucial. You have to experiment. Philips bulbs look different than GE in the most incredibly subtle way. For the lights in my showroom, I bought five different brands before finally finding the one that had the yellow tint I wanted. The Pharox LED. They’re expensive and not available yet in this country, but they have good color. What are your thoughts on LED lights for the home? The innovations are relentless. The technology keeps getting better, faster. But it’s still too early to invest in LED technology in a major way. Are you a fan of the Edison bulb? It’s a beautiful iconic form, so I like that look. But things change so quickly. If you buy a fixture that needs a specific bulb, you may not be able to find that bulb in three or four years. What are your favorite lighting shops? Lighting by Gregory on the Bowery has the biggest selection of quality lighting and lamps. 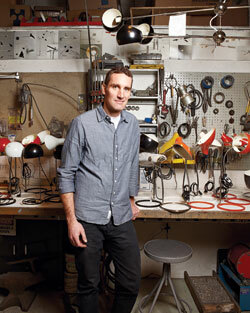 And Ingo Maurer on Grand Street has the most innovative designs and the latest technologies. Pendant lights are almost always good. The form is definitely there.